When we listen to a song, it triggers a part of the brain called the auditory cortex. Researchers at Dartmouth University found that when they played part of a familiar song to research subjects, the participants' auditory cortex automatically filled in the rest -- in other words, their brains kept "singing" long after the song had ended. The only way to "scratch" brain itch is to repeat the song over and over in your mind. Unfortunately, like with mosquito bites, the more you scratch the more you itch, and so on until you're stuck in an unending song cycle. And hot on the heels of the VASE site comes a revamped website for my professional business practice, Creativity Well. This has also been a long time in coming, but worth the wait. The home of great, Australian designed and made valve guitar and bass amplifiers. I've started a Facebook group for Pieces of Eight. As next year marks the 25th anniversary of me designing the game I have been giving thought to resurrecting it as an online application in 2010. This group is for those who played it as kids in school or perhaps used it in their classrooms as teachers. If nothing else it will provide a forum for a bit of reminiscing. I'd also like to think it might provide some ideas and encouragement to produce another working version of the classic game. See an earlier post on Pieces of Eight. Well, again there are probably larger and more exclusive bookshops than the Livraria Lello in Porto, Portugal, but there's something about this place that just makes it compelling to visit. Check out the links and see what you think. A good friend and colleague of mine, Christophe Kirsch (lucidmonkey.com), who now resides in Canada sent me this link a couple of months back. It's the private library of Jay Walker and I'll let the article and link tell the story. There may be greater private libraries out there, but I haven't seen one like this before. "Nothing quite prepares you for the culture shock of Jay Walker's library. You exit the austere parlor of his New England home and pass through a hallway into the bibliographic equivalent of a Disney ride. Stuffed with landmark tomes and eye-grabbing historical objects—on the walls, on tables, standing on the floor—the room occupies about 3,600 square feet on three mazelike levels. Is that a Sputnik? (Yes.) Hey, those books appear to be bound in rubies. (They are.) That edition of Chaucer ... is it a Kelmscott? (Natch.) Gee, that chandelier looks like the one in the James Bond flick Die Another Day . (Because it is.) No matter where you turn in this ziggurat, another treasure beckons you ..."
Once upon a time when I was a young bloke I owned a Mini - a Morris Mini Minor 850 to be precise. Bought it for a couple of hundred bucks. I really loved that car. Unfortunately it met an untimely end in an accident and it wasn't worth repairing. That was over 30 years ago. It sort of looked like the car in the advertising brochure, although I hasten to add that's not me in the white Speedos. Well since the re-release of the Mini I've been hanging around showrooms without taking the plunge. However that all changed late last year when I finally designed the car I wanted and put in an order. It took about 3 months for it to be made in Oxford and shipped over. 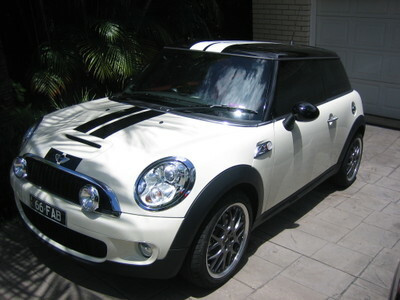 A Mini Cooper S, pepper white, black roof, red leather upholstery, wood steering wheel and trim, spotlights, GT stripes, sunroof, 17" JCW wheels with run flat tires etc. etc. Needless to say I'm very pleased and just love being in the thing. Retro looks with great performance. Drives like a slot car. No wonder I haven't had time to sit around and write. mmm... and I'm thinking about those white Speedos, the Wayfarers and a Mal for a trip to the beach. Well, I'm not sure how it all came to this, but this is my first post for the year. In my defence I am running 10 other blogs for work and social reasons but that's a pretty pathetic excuse actually. If I can work on 10 regularly then why not 11? Following will be some posts that I've had half finished but which have been stalled by other priorities. Maybe that will shake the cobwebs out of the system. Just to confirm that indeed I am a guitar tragic, I've just taken possession of a new acoustic - a Martin 000=15. It's a great, bare bones, high quality small bodied acoustic that chimes like a bell. No fancy inlays or electric pickups - just a stripped down guitar like the one you learned to play on - only about 100 times better. Although I currently have a few guitars my only acoustic is one I swapped an electric for in 1973 - an Eko Ranger Dreadnaught. I wanted it because there's a picture of one in the hands of Jethro Tull from the photos in the Living in the Past album. Very large and very Italian. It's been kicked around and had more dents and scratches that a speedway car - yet it defies age and infirmity and plays on. However a new little buddy was called for and is now with its new family. If only I had time to play it. Maybe that's a hint for a resolution for 2008. Information wheels—or volvelles—have been used since the 14th century to measure, record and calculate everything from verb conjugation to birth control biorhythms. From circular slide rules to Captain Marvel decoders, these unique artifacts are not only amusing but offer a model for modern interactive design. From the golden age of celestial cartography to more contemporary applications of both language and form, Volvelles demonstrates both the astonishing range and remarkable utility of these ingenious “interactive” tools. I’ve just picked up a wonderful book on volvelles – Reinventing The Wheel by Jessica Helfland. I’ve used volvelles for years without realising that’s what they were called. As an amateur astronomer I regularly used (and still have) a type of volvelle called a planisphere which can be held overhead and rotated to located major features in the night sky. Who hasn’t enjoyed playing with the album cover of Led Zeppelin III – another volvelle. For anyone who enjoys the graphical representation of information and ingenious analog devices, this book is a must see. I’ve even located a downloadable volvelle tool which I intend to use to create a few of my own.